Title II Certification will be are offered . Hear top expert session speakers from the U.S. Dept. of Justice, U.S. Access-Board, and National Network of ADA Centers. New this year: The ACTCP introduces our Title III Business Certificate. This is a great opportunity of those that are in charge of ADA issues in private business. This certificate will include training sessions on facility access, website access, customer service, employment issues, and more. As an attendee, if you already have earned the ACTCP Title II Certification you would need to attend all “D” sessions on day two. That's it. There is no exam and no online courses after the conference. Just attend the "D" sessions and you will earn the certificate. and then all the “D” sessions on Day 2. If you can show us that they have previously taken the 2010 Standards prior to the conference then you would not have to repeat it. 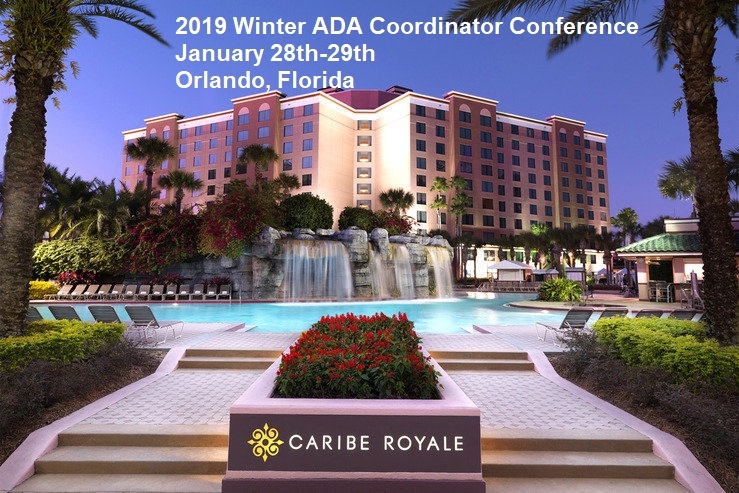 As an introductory offer for the 2019 Winter ADA Coordinator Conference only, those attending may earn this certificate at no extra charge. and the Great Plains ADA Center.